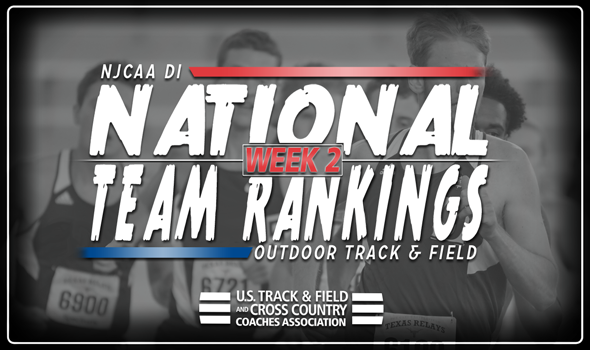 NEW ORLEANS – The top-10 women’s NJCAA Division I teams, as well as the top-nine women’s teams, remained in place in the newest round of NJCAA Division I Outdoor Track & Field National Team Rankings, announced the U.S. Track & Field and Cross Country Coaches Association (USTFCCCA) on Wednesday. There was a fair share of action this past weekend, but it truly did not greatly affect the rankings. Only the men’s program from Meridian (Miss.) CC made any kind of movement in the top-10, as it jumped one spot to 10th after Joshua St. Clair posted a 20.91 in the 200 at the Crimson Tide Invitational over the weekend. The NJCAA Division I Outdoor Track & Field National Championships will be held on May 17-19 in El Dorado, Kansas. South Plains (Texas) had a solid weekend at the Angelo State David Noble Relays, where it notched 10 top-10 NJCAA Division I Descending Order List marks to keep itself in first place in the rankings. The Texans were led by Danylo Molchanov, who recorded the second-best triple jump in NJCAA Division I this season at 15.50m (50-10¼). Behind the Texans once again was Barton (Kan.) CC, which competed at the Don Kirby Tailwind Open and the WT Classic & Multi last weekend. The Cougars’ Enrique Martinez posted the top hammer throw mark in NJCAA Division I at the WT Classic & Multi with a throw of 61.13m (200-7). All in all, the Cougars posted a total of 10 top-10 NJCAA Division I Descending Order List marks across the two meets. Once again, spots three through fifth belonged to Iowa Central CC, Cloud County (Kan.) CC and Central Arizona. New Mexico JC only posted three top-10 NJCAA Division I Descending Order List marks this past weekend, but it was enough to keep the Thunderbirds in first place in the rankings. Esther Gitahi paced the squad with a 17:49.88 (converted to 17:32.38 for altitude) in the 5000 at the WT Classic & Multi. The sophomore’s mark sits third on the Descending Order List. Central Arizona held down second place in the rankings on the heels of its performance at the 39th Sun Angel Classic. The Vaqueros hit six top-10 NJCAA Division I Descending Order List marks at the meet, including two second-place marks by Nicolee Foster (400 hurdles) and Devia Brown (discus). Rounding out the top-five for the second-consecutive week was South Plains (Texas), Iowa Central CC and Barton (Kan.) CC.